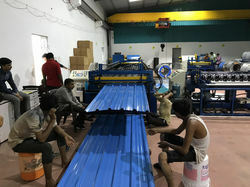 We are a leading Manufacturer of roof sheet forming machine, corrugated roof roll forming machine, metal roof sheet forming machine and color steel roof sheet forming machine from Rajkot, India. To retain our goodwill in client's consideration, We manufacture a qualitative array of Roof Sheet Forming Machine. By keeping track of current market development, we are offering a commendable range of Corrugated Roof Roll Forming Machine. Our offered machine is widely applicable in a number of industries. Matching up with the ever-increasing requirements of the customers, our company is engaged in providing Metal Roof Sheet Forming Machine. Being the leading names in industry we are offering a wide assortment of Color Steel Roof Sheet Forming Machine.